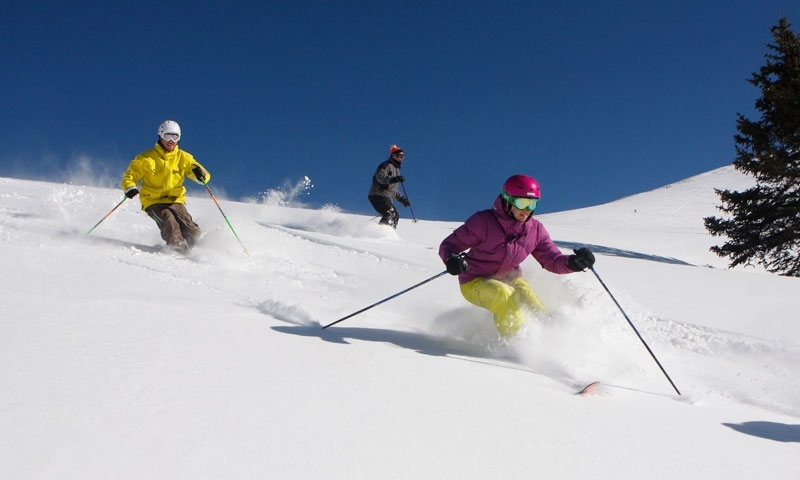 Whether you've come to ski Copper Mountain, challenge the terrain parks, hit the links, or simply relax in the spas, restaurants and hotels, Colorado's Perfect Ski Mountain has something for every visitor. Summer or winter, Copper Mountain Resort has something for everyone in one of the largest ski resorts in Colorado. Old skiers, young riders, mountain bikers and golfers all flock to this mountain mecca, boasting some of Colorado's best summer or winter terrain. The slopes are incredibly well-balanced for a mountain of such size. Beginner, intermediates and experts will all find terrain to suit their needs, whether it's the bunny slopes, the bowls, the terrain parks, or the tubing hill. The Village at Copper hosts year-round activities, appropriate for everyone. Take some time to explore the shops, head out to West Lake for some paddle boating or ice skating, and don't forget the restaurants and cafes simply waiting for you to drop in. Located 75 miles west of Denver and 20 miles east of Vail, Copper Mountain Ski Resort is easily accessible from multiple locations. Copper is one hour and 45 minutes from the Denver Airport at exit 195 off of I-70, depending on road conditions. Also, it's a quick hour and 15 minutes from the Eagle Airport. Bus service is available throughout Summit County on the Summit Stage, a free service running from 6:00am to 1:30am. In addition, there are multiple shuttle companies that will provide transport between airports and the mountains, as well as between the mountain resorts and the surrounding towns. Copper Mountain Colorado Ski Resort opens in early November and closes in late April, depending on snow conditions. Upper lifts close at 3:30pm. Copper has an excellent Racquet and Athletic Club, complete with extensive spa facilities as well. There is childcare and ski school for the youngsters to attend while the parents explore the resort and share some grown-up time. Equipment rental is available at the mountain, as are tuning and repair services to keep your equipment in tip-top shape. The shopping options are abundant in the Village, as are the restaurants and cafes with great happy hours and aprés-ski specials. Hotels and other accommodations are available, including ski-in/ski-out options for the serious skiers coming to visit. In addition, Copper Mountain Colorado Ski Resort can host private gatherings both small and large, including weddings and other events. Take your next ski vacation to Big Mountain and the Whitefish Mountain Ski Resort in Montana! Plan a vacation to Crested Butte Colorado. Plan a family ski trip to Buttermilk, and Aspen Colorado. Plan a getaway to Snowmass Village, Colorado.